I have been in deep reflection for the past 3 weeks. Today marks the end of my visioning process that happens yearly for me between the winter solstice and my birthday. It feels particularly auspicious to write to you today – a full moon, my 45th birthday, and a time when my gratitude for my readership and for my business is something I feel so deeply. It’s a dynamic process that has come with both the groovy feelings of inspiration and success, along with seeing where I still want to make certain changes, break though old patterns, and dig a little deeper to find what’s underneath it all. We all have habits and patterns that we would like to change. The New Year often brings these into the light, to shine some awareness on where we would like to make improvements, take better care of ourselves, work smarter not harder, and live healthy vibrant lives. The problem is, change is incredibly hard. So often we are fixed upon changing our ways – our eating, our exercise, our spending, our over extending, our people pleasing, and our lives in many ways, big and small. As we see from the broken New Year's resolution phenomenon, people rarely change these patterns. It has been found that only 8% even make it past mid-January with attempting new ways before they give up completely. This New Year's phenomenon is most often because we are simply looking at the behavior - the behavior that is a reaction or response to something deeper. Our automatic behaviors are so often coping skills for our old, original, core wounding. Feeling the pain, sadness, anger, disappointment, let down, abandonment, or inadequacy of our core wounding is often very uncomfortable. What is underneath your overeating? What is underneath your over spending? What is underneath your sugar addiction? What is underneath your reclusing? What is underneath your drinking too much? What is underneath your self-sabotaging? The New Year comes, and we look at all of these behaviors, and think…something has to change. The problem is, there is so much underneath these behaviors that we are most often missing. When we address the core issue (which takes a little bit of investigating), we are able to begin healing that wound. These core wounds are usually pretty old, deep, and complex. Core wounds are almost always a bit tender, raw and uncomfortable and most of us go to extremes to avoid feeling uncomfortable. When the wind was howling through Boulder Sunday night, I restlessly laid in bed, but just could not fall asleep. I had spent a good part of the day journalling, asking, and inquiring into my own personal blocks. Not only was I steeped in my own inner dialogue that was revealing some truths about where I get stuck, but my house was literally shaking in the wind. The whole night felt pretty surreal. Something I did earlier that day – a question I asked myself, a reflection I had seen, some history of both my adult life and childhood – offered something back to me. I touched the wound. The real deep one. This is often called our sacred wound, or our core wound. We all have one. This is the 'thing' we are desperately trying to cover up and cope with through some of our automatic behaviors and habits. Covering it up may seem to work for a while, but it makes changing those old behaviors and habit almost impossible. What I want to share with you today is both how I was able to uncover some of this wounding within myself, and then, how to manage it. In this process, you may see your challenges and your hindrances. Ironically, they will become your portholes into your creating a harmonious and inclusive relationship with yourself. You will get stronger, more embodied, more connected to who you are – and all of this will lead you positively to your own unique breakthrough around what you are wanting to work on this year. What is the behavior you are wanting to change? Have you ever tried to change it before? Once we identify what we are working on, we can begin the excavation process. What is underneath this behavior? Take a deep breath. Give yourself some sacred space. Feeling our feelings and exploring our inner landscape requires a little time and space. Try not to rush this. This is actually not meant to be a 'thinking' exercise, but rather an intuitive exercise in connecting with your deepest self. Most often, the first thought around what is underneath your behavior (the one you want to change), is the best one to start with. Feel into your sensory body. Notice what happens when you explore your sacred wound. Shortness of breath, tightness, panic, love, compassion, warmth, openness. Some of us suffer big traumas early in life that change us forever. Some have happy childhoods but are wounded nonetheless. Core wounds tend to be things like a sense of not being enough, being unlovable, not having enough, feeling alone, or unworthy. No matter what your core wound may be, you can guarantee that your wound influences who you are and how you behave. What I really want you to know is that allowing yourself to feel the uncomfortableness of your sacred wound, is likely the most healing action you can do for yourself. This is truly the most important of resolutions, intentions, or New Year's goals you could give yourself, while it is also the most effective way to change those old outdated behaviors that continue to haunt you year after year. When you are safe and snug in your home, you have the space set aside for yourself, and you are ready to really make a shift in a big way this year, dig into your most courageous self, get fearless, stay strong and centered, and give yourself full permission for the next little while to feel into the uncomfortable. While it may be hard to be fully free ourselves of our sacred wound forever, we can surely begin to understand how our behaviors can either hinder or support our healing. Once we are able to recognize where our negative patterns and habits may be originating, we can begin to navigate around them more effectively. Once we are willing to be uncomfortable and we become more familiar with our sacred wound, we won't need to cover it up so desperately. Instead, we will be more willing to get to know it – all her peaks and valleys and all her history. Your sacred wound contains a blueprint of some deepest parts of you. Can you tend to yourself with gentleness and care? This process of acceptance will allow you to be at peace with your inner world as you hone your behaviors and habits in your outer world. We thrive with support. With the right type of support, the rate of acceleration towards our intentions is more than tenfold. Transformations happen quicker. Breakthroughs occur more often. Follow through is fierce and fabulous… and our resistance recedes (phew). We do well with accountability, conversation, depth with another, sharing, connection, and seeing the commonalities that we all have. If you are looking for support around changing some of your behaviors and habits (especially around your health), looking into your own sacred wound, and making this year a breakthrough year, I have a couple of ways to help. Click HERE to find out. Your support system awaits you. 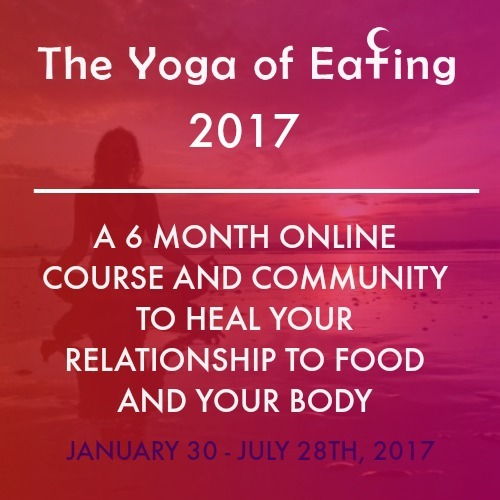 THE YOGA OF EATING 2017: the most in-depth and detailed body of work I offer, and a way to work with me personally, while feeling the support of others on a similar path to transform your relationship to food and your body. 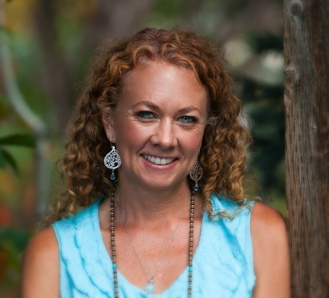 This 6-month online course and community is full of incredible resources, potent international guest teachers, deep and reflective monthly content, guided yoga and meditation practices to enhance your inner journey, a beautiful circle of women from many corners of the world, and age-old practices that guide you to deep healing from the inside out. This is a great opportunity to explore your practice in a new way, to check out little tasters from THE YOGA OF EATING 6-month program beginning January 30th, and to deepen into your 2017 dreams and intentions. During January, in all 5 classes, we will be hosting a food drive for Harvest of Hope! Bring non perishable food items to class as a donation.